Since April 2012 DC Comics have been publishing a back up strip in Justice League that chronicles the adventures of a rebooted Captain Marvel. The Curse of Shazam has given us a radically different interpretation of Captain Marvel and his world. 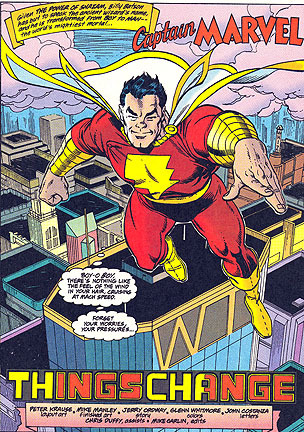 In fact, he's not even called Captain Marvel any more, just plain old Shazam. As you can imagine these changes have caused some controversy. Fans have been very vocal in decrying this somewhat darker, more adult take on what has traditionally been an innocent, child-friendly character. I have to say however, I've been enjoying the changes and I'd go as far as to say that DC should have done something like this with the character decades ago. It may surprise you to learn that Fawcett Comics' Captain Marvel was the most popular superhero of the 1940s. His comics were even outselling Superman at one point! It's not hard to see why the story of Captain Marvel struck a chord with so many people. His origin is probably every kid's fantasy. An old wizard grants young Billy Batson the ability to turn into an adult superhero, Captain Marvel, by uttering the wizard's name, SHAZAM! 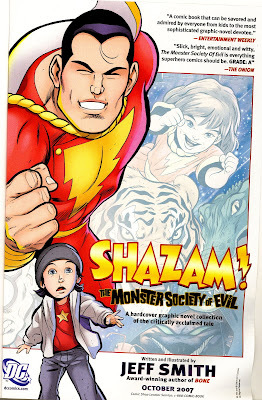 Billy was soon joined by his sister, Mary Marvel, and a sidekick, Captain Marvel Jr. The Marvel Family's adventures were so popular that even Elvis Presley was a fan. Elvis was such a big fan of Captain Marvel Jr. in particular that he based his haircut, his insignia and many of his costumes on the character. So where did all go wrong? Blame DC Comics. They sued Fawcett Comics for copyright infringement, alleging that Cap was a rip-off of Superman. By 1953 Fawcett had ceased publishing all of their Captain Marvel comics due, at least partly, to the law suit. Then in 1972 the cheeky gits at DC licensed the characters and started publishing their own Captain Marvel comic (although the existence of a Marvel Comics character of the same name forced them to name the comic Shazam!). 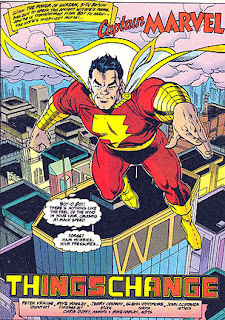 By 1991 they had acquired all the rights to the characters and Captain Marvel was a fully integrated part of the DC Universe. It could be argued that this was to the character's detriment. Captain Marvel was never to achieve the popularity he saw in the 40s ever again and it's not hard to see why. He was always billed as "The World's Mightiest Mortal", but now he was sharing a world with Superman. As long as Superman, DC's flagship character, was in the same Universe as Cap then Cap would always be second best. If he wasn't the "World's Mightiest Mortal" then what was he? 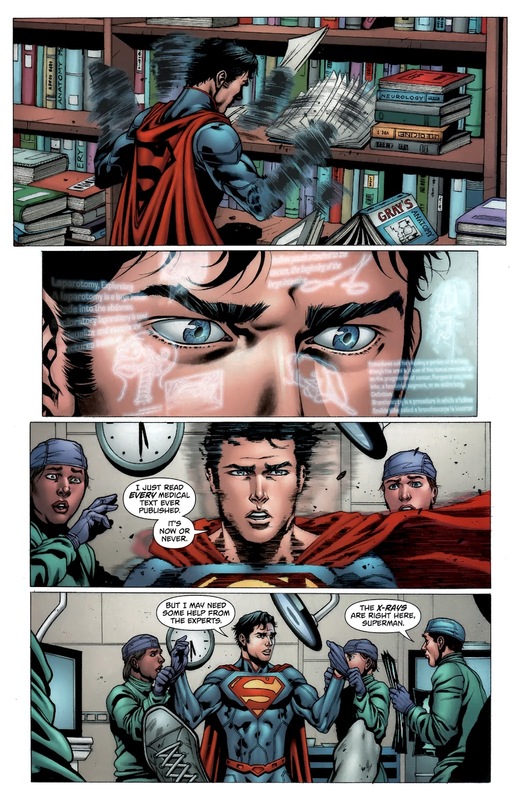 Granted, up until 1986 Cap had his own parallel Earth to live on, Earth S, but he and Superman still essentially existed alongside each other and the two characters often teamed up. Since 1972 Captain Marvel has been a square peg trying to fit into the round hole of the DC Universe. Cap's world was a world of wizards, talking tigers and evil worms from Venus and his adventures had a completely different tone from those of the DC Universe. Imagine Spider-Man and his supporting characters were taken from Marvel Comics and integrated into the DC Comics Universe. Could you keep writing the same kind of stories for the character? Would he be as popular as he is now? DC had a hero that worked according the the rules and context set by Fawcett Comics and they were now trying to make him work according to the rules and context of DC Comics. Despite all this Captain Marvel still seemed to work well as a supporting character. In the 70s he was another heavyweight for Superman to team up with or fight, while in the 80s, 90s and 2000s he was an innocent character that harked back to a bygone age that DC could use to contrast with their more contemporary characters. But in his own comic the tone never seemed right. The character was originally based around wish fulfilment but this aspect had been lost. 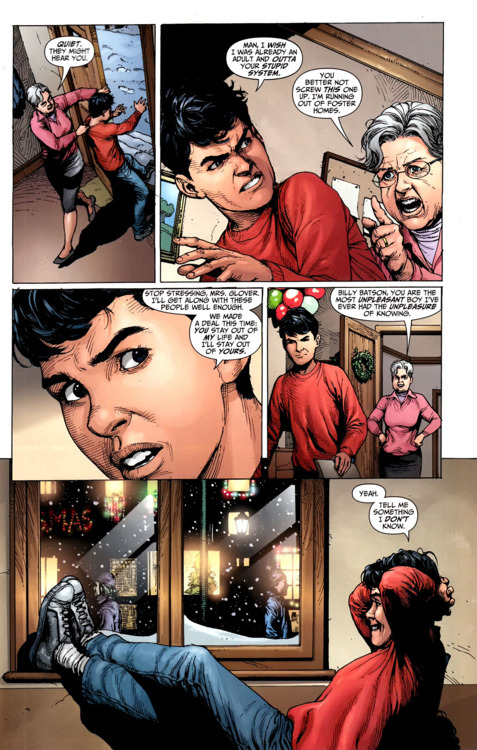 DC were so busy playing up the "innocent character from a bygone era" angle that Billy Batson now resembled no one who was likely to be reading the comic, even the kids. DC were also making clumsy attempts to make the character edgier by playing up the "homeless orphan" angle. These attempts always seemed to fall flat however when played alongside the aforementioned "innocent" aspect of the character. You can't have a character boasting that he's "from the streets" one minute and then exclaiming "Holy Moly" the next. "I've lived on the streets"
It seemed like DC wanted to make him edgier but were reluctant to give up the more innocent aspects of the character. They couldn't have it both ways and it was time to choose a direction for the character; innocent or edgy. And finally, in 2012, DC chose. 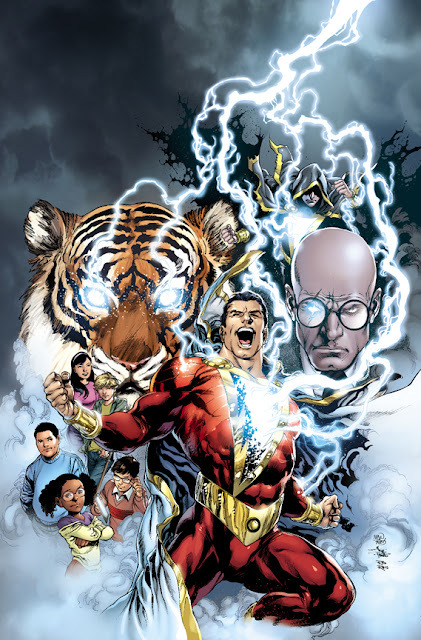 With The Curse of Shazam DC have abandoned the sweeter, more innocent aspects of the strip completely and finally fully embraced a take that's more adult and much grimmer. Billy's inherent nobility is buried under a layer of bitterness and teen angst while the wizard Shazam is yellow toothed and creepy. I'm thoroughly enjoying this take on the character. Billy seems to have a proper character arc ahead of him, with his more noble side being teased out gradually by his new family. It also seems like his super-powered alter ego will have a more clearly defined role in the DC Universe, with DC promising to remove the "circus strongman" elements of the character that invite comparison with Superman, and play up the magic and fantasy aspects. But was this really the right way to go? Why did DC have to embrace the grimmer side of the character when they could just as easily embraced the more innocent, child-friendly side? It's a question that's worth asking, especially considering works such as Jeff Smith's Monster Society of Evil prove that there are great stories to be told with a child-friendly, all-ages Captain Marvel. I would argue that it's perhaps pointless pushing the character in an all ages direction when there just isn't a suitable format for those stories. If I was a parent who didn't read comics I would be very reluctant to go to a specialist comics shop to spend at least two to three pounds on a twenty page pamphlet for my kids. If Captain Marvel comics are to be directed at kids then they need to be easily accessible and in a format that offers value for money. It just so happens that my pals Duy Tano and Pol Rua have some great ideas about what that format should be. 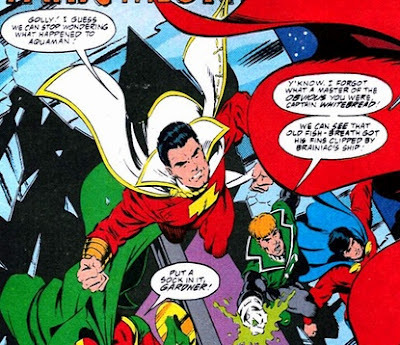 Until such a format exists however I believe that The Curse of Shazam offers the only take on the character that could conceivably work in the context of the current state of the DC Universe and the current comics distribution system. 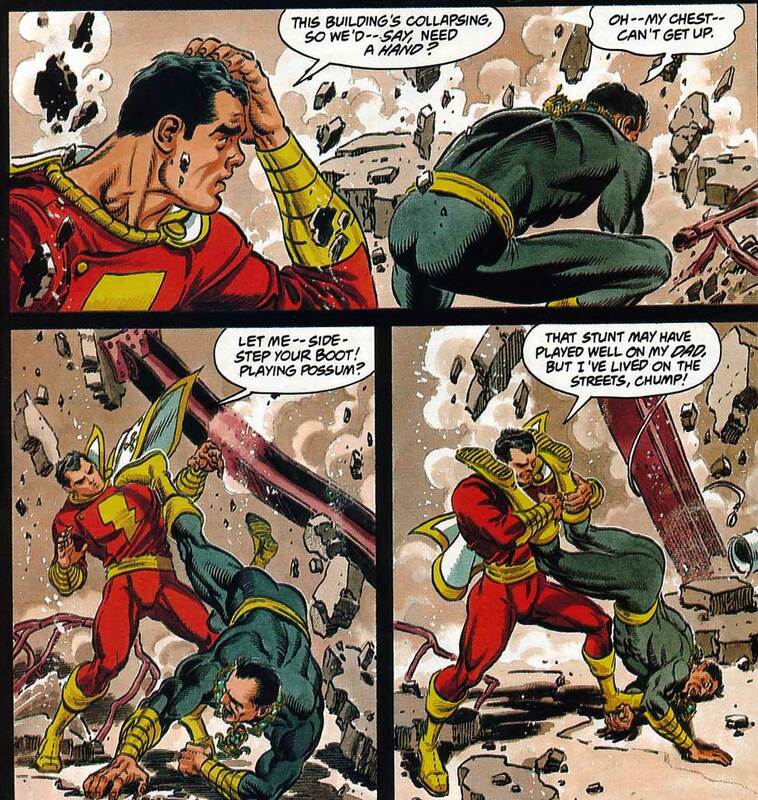 With all the drastic changes brought about by Captain Marvel's recent reboot, the most controversial one seems to be the changing of his name from Captain Marvel to Shazam. DC's official reason for this is that "everybody thinks he's called Shazam already, outside of comics." On the surface this seems like a silly reason. When I was a kid I used to think that the Thing was called Rock Man, but I wouldn't expect them to change the character's name as a result of this. But I suspect that the real reasons for the name change make a lot more sense. It's no secret that DC have had a Shazam movie in the works for ages. Ask yourself, are Warner Brothers (whose current big rivals in the cinemas are Marvel Comics and their owners, Disney) really going to pour money into making and promoting a superhero film with a lead character named Marvel? If Cap comes to the big screen he's almost certainly going to be called Shazam, so why not reflect that in the comics? But whatever he's called, I would argue that DC's current direction for the character is for the best. For years Captain Marvel has been straddling two different styles, innocent and edgy, and it's held the character back! DC finally have the courage to let go of the past and take the character into uncharted waters. Maybe one day we'll see the return of a sweeter Cap and I would dearly love for there to be a suitable place in the world of comics for such a character. But for now I'm happy to see where our darker, new Shazam is headed. Hopefully to Hollywood! I'm indebted to Duy Tano and his Comics Cube for a lot of the info used in this article. If you want to read more about Captain Marvel then give The Cube a look. In this article I've echoed many of the sentiments expressed in Duy's A Sense of Wonder: Why DC Has Failed to Successfully Incorporate Shazam! into the DC Universe although we differ on the merits of The Curse of Shazam. Duy also addresses the similarities between Superman and Captain Marvel in Reclaiming History: Superman Vs. Captain Marvel. Duy also discusses his personal connection to the character in What Captain Marvel and the Marvel Family Mean to Me. Well worth a read! Superman vs. Morrissey - Buy the T-Shirt! You can now buy a t-shirt featuring the above image of the Man of Steel and the Pope of Mope. You can buy it here from bluecatstore.com! Regular readers of this blog might have observed that I'm something of an apologist for DC Comics' New 52. DC's line-wide reboot (now in it's twelfth month) has been far from perfect but, for me at least, there have been many high points. Highest among them has been Grant Morrison's work on Action Comics.Today saw the release of Action Comics #12 and it was one of the best issues yet. I love this comic so much that it depresses me that there may be Superman fans out there who are not getting it. Perhaps you're one of them? Perhaps you were put off by Superman's t-shirt, or his v-necked armour? Perhaps you didn't bother with it because Clark and Lois aren't married any more? 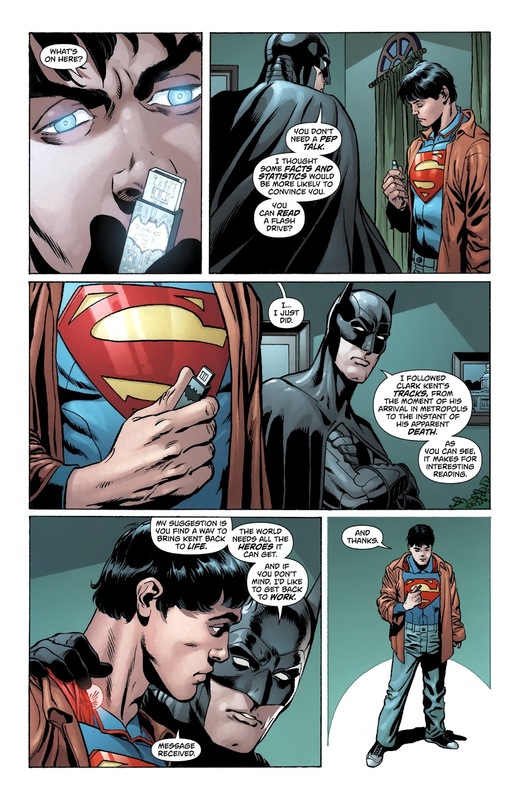 Perhaps you sampled the first few issues and felt that a younger, brasher, more arrogant Superman wasn't for you? Perhaps the inconsistent art has put you off? Perhaps you couldn't be bothered with another reboot? All legitimate, understandable reasons, but please, from one Superman fan to another, you owe it to yourself to give this comic a chance, or even a second chance. 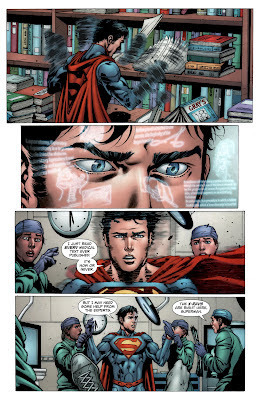 Please allow me to give you three examples from issue #12 of the awesomeness that is Grant Morrison's Action Comics. 1) Are you absolutely sick to death of reading about Superman doubting himself and carefully considering the consequences of his actions? I know I am. Well fear not! Morrison has the answer to that! That's right, Morrison's Superman has an instinctive grasp of right and wrong and follows these instincts with the impetuousness of youth. Must there be a Superman? Who cares? Take that evil-doer!! 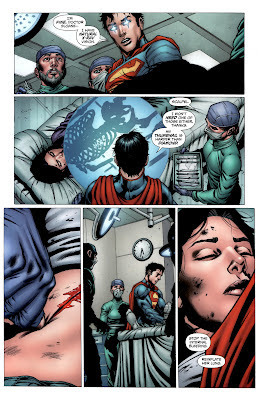 2) How many times in the past couple of decades have we seen Superman sitting helplessly by a hospital bed, tears welling up in his eyes as someone close to him (probably Lois) lies at death's door? 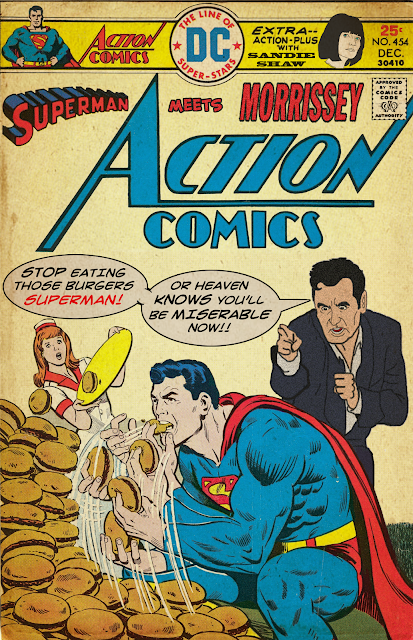 Well, not in Action Comics #12! Check this out! This is a genuine super-feat, the likes of which we haven't seen in years. Under Morrison it really feels like Superman can perform miracles again. 3) In the previous issue, Superman had abandoned his Clark Kent identity, feeling it had served its purpose. 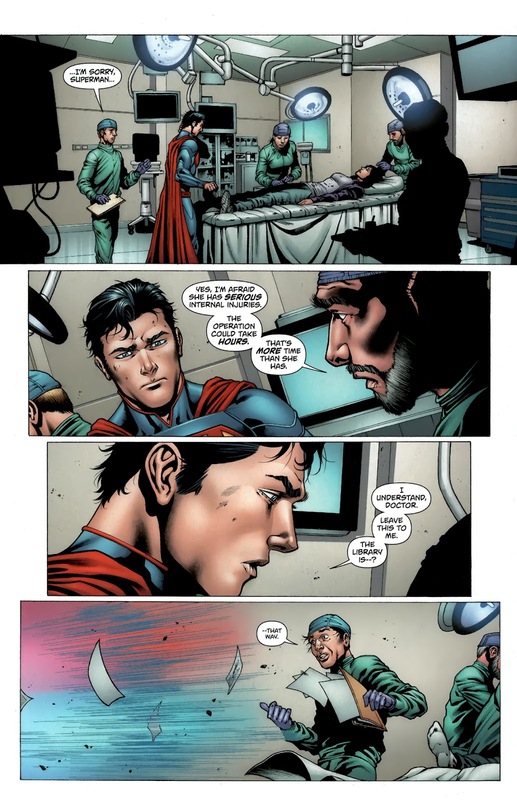 Leave it to Batman then, the most human member of the Justice League, to remind Superman of the importance of his humanity. And check out the very Batman-like way he does it. Not with an impassioned plea or a lecture, but with statistics and facts. 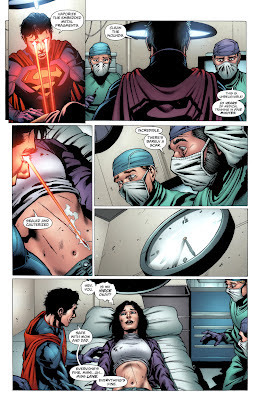 Clark Kent can do just as much good as Superman and "the world needs all the heroes it can get"! So give it a chance, even if you're not a Superman fan. Hopefully what I've shown you with these three snapshots of issue #12 is that Morrison's Action Comics is fun. And who doesn't like fun? And if you still don't like it, well not to worry, Morrison's leaving the title with issue #16. 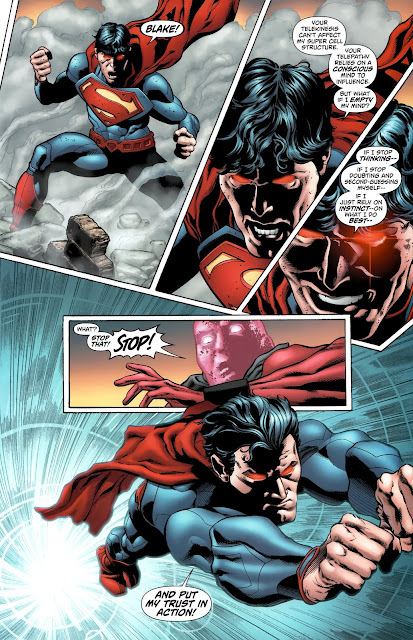 But as far as I'm concerned he will have left us with one of the all time best interpretations of Superman.